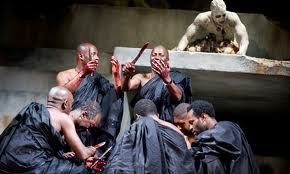 Just two i-Player days left to catch up with the film version of the RSC’s production of Julius Caesar – “Shakespeare’s African play”. Set in a modern day African state after independence, with echoes of contemporary events in the Arab Spring, the production was filmed on location in a disused shopping centre in North West London and at the RSC, and features an all-black British cast. RSC’s Artistic Director Designate, Greg Doran, has discussed the influence on the production of regime change, and links with the ‘Robben Island Bible’, the copy of the Complete Works of Shakespeare smuggled into the notorious South African prison during Apartheid in the 70s. 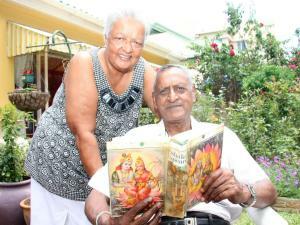 Belonging to ANC inmate Sonny Venkatrathnam, the book passed the strict censors, allowed because guards thought it was a prayer book, having been disguised with images of Rama and Sita torn out of a Hindu calendar. This secret copy was passed around, read and cited, with passages underlined and shared between inmates: Julius Caesar is the most annotated play in the Robben Island Shakespeare; Mandela wrote his name next to Caesar’s lines, ‘cowards die many times before their deaths/The valiant never taste of death but once’ – according to Mandela’s official biographer, Anthony Sampson, Mandela chose this passage as his favourite. N.b. It potentially feels like an old debate, but this is where the links to my own research come forward – the ways in which South African literature becomes ‘South African’, what is its particular ‘South Africanness’ and how is this defined in relation to what it is not. And specifically how white English-speaking writers – and in the case of Ivan Vladislavic, male, white English-speaking writers – negotiate definitions of South Africanness, particularly after Apartheid and as inevitable beneficiaries of the Apartheid regime. Having just been to Cape Town (for the Cape Town Book Fair) and having visited Robben Island for the first time, seeing Mandela’s cell in which he was incarcerated for 18 years, hearing first-hand from an ex-political prisoner about the Robben Island Bible and the Robben Island ‘University’ – a small cave, which was part of the prisoners’ enforced labour limestone mine that had been designated as a toilet, and because it had been designated as a toilet, prisoners were secretly taught to read and write in the sand, on the floor, able to because the guards were unaware that the stinking hole was potent in ways they could not anticipate – a hive for basic education that had been denied to most and a site for the re-writing of history – these issues press in a particularly resonant way. As p art of the London Southbank’s Africa Utopia – ‘Robben Island Bible’ will be held in the Purcell Room on July 3. The event will present readings from Matthew Hahn’s play, which dramatises the story of the Robben Island Bible, featuring extracts of Shakespeare intercut with testimony of the prisoners. Ashwin Desai will introduce the staged reading with a keynote talk on his book, Reading Revolution – Shakespeare on Robben Island. AND – the Robben Island Bible will be on display at the British Museum as part of their ‘Shakespeare: staging the world’ exhibition, July 19-November 25. Can’t wait to see the book itself! Booking (hehe – see what I did there?) is recommended. Lastly, also as a kind of a follow up to my earlier post, ‘Shakespeare in IsiXhosa, Afrikaans, Swahili, Juba Arabic, Shona and Yoruba‘, and to round off by looking at all of this in the context of this article by Emer O’Toole, guardian.co.uk, on the Globe to Globe project as part of the World Shakespeare Festival in May; the debate it raises evident in its title (and from its comments): ‘Shakespeare, universal? No, it’s cultural imperialism’. AiW has more on the Globe to Globe Festival 2012 here.